Busy marketers rarely have time for reflection. But this is the time of year we tend to look back as a society and see what we can learn from the previous year. So don’t overlook this opportunity to relax, refresh and plan for the year ahead. 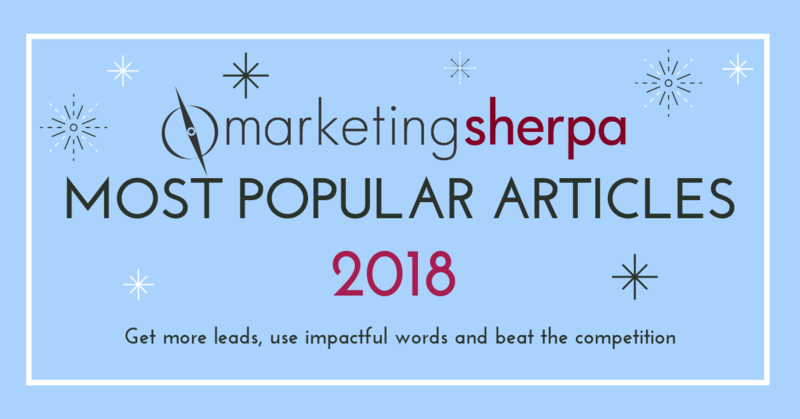 To help you improve your marketing in 2019, let’s take a look at the most popular MarketingSherpa articles of 2018. Read on for the content your peers found to be the most helpful, and get ideas for generating more leads, using impactful words and beating the competition. There are many resource-intensive ways to increase conversion — from major media campaigns to expensive technology implementations. But marketers shouldn’t overlook the simple changes as well — getting the most value out of each word you’re already using to communicate with customers. As this experiment shows, a minor word change in a call-to-action can have outsize results. Everything is relative. No conversion rate — on its own — is good or bad. It can help to benchmark your performance against that of your peers to see how your conversion is performing. In this article, we look at data for not only the average ecommerce conversion rates but also at the 10th, 25th, 50th, 75th and 90th percentiles to give marketers a more complete picture about the conversion rates other ecommerce marketers are experiencing. Take a glance at these numbers and see how your ecommerce site’s conversion rates compare. Experimental data helped Aetna’s HealthSpire discover that a longer landing page generated more leads than a shorter landing page. Some of the folks that were the most fun for me to work with during my marketing career were in the Competitive Sales Office of a software company. Hey, we humans are just competitive by nature. So it’s no surprise that the most popular piece of MarketingSherpa content in 2018 was a blog post that included free competitive analysis templates. There were many hype-filled marketing buzzwords in 2018 — from conversational commerce to blockchain-powered digital advertising — and they very well may end up being the future of marketing as we know it. But this much is sure. Words still matter. For that reason, one of the most popular articles on MarketingSherpa in 2018 was actually published in 2003. Like looking back through a high-school yearbook, there are a few cringe-worthy phrases redolent of the early days of internet marketing — “email blasts” — but this article is mostly a simple yet helpful list of shorter, more powerful copywriting words to use in place of less clear (and often more pretentious) words and phrases. If you’re looking to improve the power of your marketing copywriting, you should read this article in the near term soon. That competitive fire is strong in marketers, like the Jacksonville Jaguars’ defense shutting out the high-powered Colts offense … even though the Jags season is essentially over and they can’t make the playoffs. Marketing 101: What is conversion? 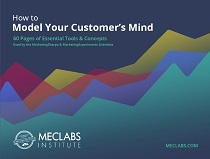 Conversion is at the heart of marketing — positively influencing a customer choice by helping them better perceive the value of your product and making the right choice for them. In this blog post, we take a closer look at the definition of conversion. Especially helpful for newer marketers.